Usually, grown children begin to realize that Mom and Dad or another cherished family member - the one with most of the family knowledge (or as we call them, "family experts") - are getting older. Maybe the grown children have been to a few funerals of their parent's friends. Maybe their parents are starting to get sick. It slowly occurs to the children that their parents may not be around for much longer and when these irreplaceable and precious members of your family are gone, usually the history, stories and anecdotes go with them. Lost ...forever. 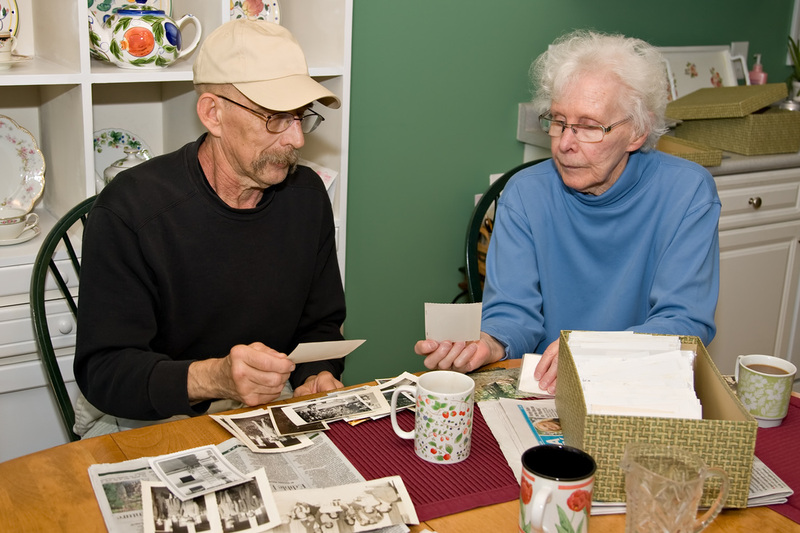 Once committed to doing a family history, family members choose a "family expert" to participate in the Q & A videotaping. We suggest having a family meeting to get a general consensus of opinions...who is the most knowledgeable person in the family? Your 'expert' is asked to relax and answer the questions as truthfully as possible. Stress to your special loved one that you want to preserve whatever they remember of the past (and their own special stories of growing up). Not just for their children and grandchildren, but for all the children in all the generations who will follow. ​Once your "expert" agrees, we ask that they go through their photo album and pick about 30-images that represent the history of the family and help illustrate the stories they will be talking. We will use these pictures for the video. We go to that person's home and sit at a kitchen table or outside on their porch or in the living room (we use the best natural light available for filming), and very simply put, we chat.There's a very small video camera sitting on the table or a tripod. There's a lot of easy going and friendly conversation back and forth as the interviewer and "expert" get to know one another and relax. The interviewer eases into the questions chosen by family members and the "expert" responds. The "expert's" memory begins to come alive with experiences, emotions and stories. Suddenly they remember things they hadn't thought of in 50 years. Metal Barn feels blessed to be present during this epiphany. Many customers later tell us that during the interview they felt listened to for the first time in a long time. When we're done with the interview, we take the raw footage back to our studio and edit it until the story is 'told' as eloquently as possible. ​The editing process is the most time consuming part of creating an Oral History DVD. A timeline of video clips and family photos are 'laid down' to best tell the story and oral history. Transitions are added, "Ken Burn Effects," narration, titles and captions, music. After our editors feel that the video has the spirit and visual effects most desirable, you - the client - get to view it privately on https://vimeo.com or https://www.YouTube.com. You are given a password to give you access. You watch the video as many times as you like and write down any changes you want. You get to make changes one time. So we encourage clients to take their time with the 'review' process. https://vimeo.com or https://www.YouTube.com for a final viewing. Now we burn your history to a DVD or Blu-Ray disk.